12th Annual Salsa on the Square Shares Hispanic Heritage | The Gettysburgian. On Friday, September 28, Project Gettysburg-Léon hosted its 12th annual Salsa on the Square outside of the Majestic Theater. The street was brightly lit, framed at sunset by flaming clouds, and couples, parents and children, and groups of friends danced to music, whether they could salsa or not. 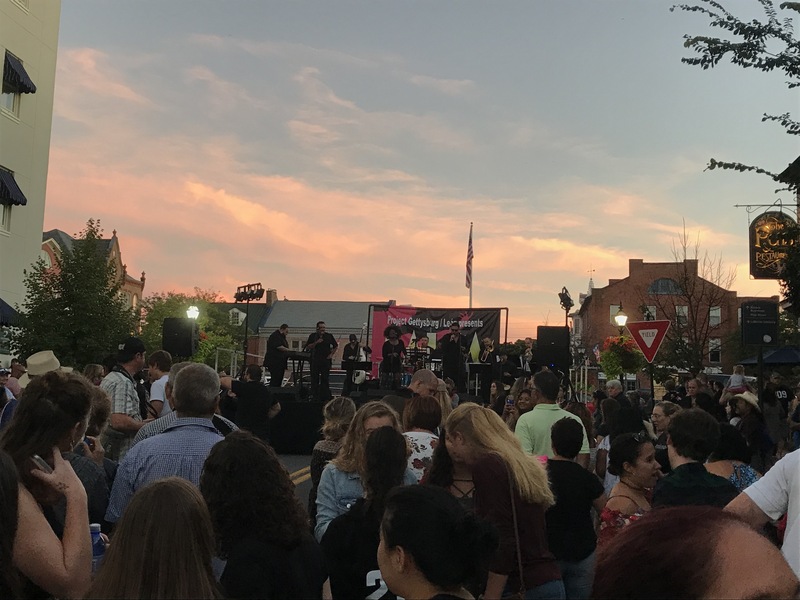 Salsa on the Square, scheduled to coincide with National Hispanic Heritage Month, celebrates Gettysburg’s Latino population, their contributions to Adams County, and Gettysburg’s sister city relationship with Léon, Nicaragua. Music played throughout the night; Hector Rosado and his Orquestra A-CHE performed sets during the event, and DJ Solalinde provided music between sets. For those who did not want to dance, children’s games were organized in partnership with Vida Charter School, and there was no shortage of food: vendors included Casa de la Cultura, PGL’s main partner in Gettysburg, El Costeño, and the college’s Servo Truck. Finally, Waldo’s and Company had coffee and tea but also hosted an exhibit of photos and artwork of Nicaragua. Fleites emphasized the participation of students in the event. Their attendance is critical, of course, but over fifty student volunteers helped the event run smoothly. Thursday night, students and faculty held a salsa lesson, and both events were CYC credits for first-year students. Project Gettysburg-Léon always welcomes more student involvement, and Salsa on the Square is only the beginning of what they do in Gettysburg; find them on Facebook and Instagram to learn more or to get involved.